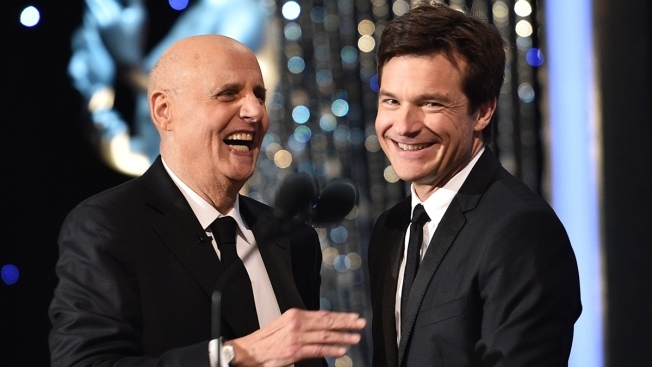 Actor Jeffrey Tambor, left, receives the Outstanding Performance by a Male Actor in a Comedy Series award for 'Transparent', from actor Jason Bateman, right, during The 22nd Annual Screen Actors Guild Awards on January 30, 2016 in Los Angeles, California. To promote the fifth season of Netflix's "Arrested Development," seven of the cast members reunited earlier this week for a wide-ranging, hourlong group interview in The New York Times. At one point, culture reporter Sopan Deb mentioned the sexual misconduct allegations made against Jeffrey Tambor on the set of "Transparent." During his recent mea culpa interview with The Hollywood Reporter, in which he shared side of the story for the first time, Tambor had made a revelation about an on-set "blowup" he had with Jessica Walter on the set of "Arrested Development" years earlier. Expressing regret, he said he'd "profusely apologized" to the actress. At the time, Walter's publicist said she did not wish to speak about Tambor. To date, no one from the show has discussed the specifics related to that incident. Both Tambor and Walter participated in The New York Times discussion, as did Will Arnett, Jason Bateman, David Cross, Tony Hale and Alia Shawkat; Michael Cera and Portia de Rossi, the show's other two stars, did not contribute. In his interview with The Hollywood Reporter, Tambor acknowledge he could be "difficult" on the set of "Arrested Development"--something Bateman shrugged off in the group discussion, saying, in part, "In the entertainment industry it is incredibly common to have people who are, in quotes, 'difficult.'" Shawkat challenged her co-star for defending Tambor's behavior, saying, "But that doesn't mean it's acceptable." Arnett, Bateman and Cross cracked jokes and made excuses for Tambor when Walter was asked to finally share her thoughts on the actor's behavior. "This is a family and families, you know, have love, laughter, arguments--again, not to belittle it, but a lot of stuff happens in 15 years," Bateman said. "I know nothing about "Transparent" but I do know a lot about 'Arrested Development.' And I can say that no matter what anybody in this room has ever done--and we've all done a lot, with each other, for each other, against each other--I wouldn't trade it for the world and I have zero complaints." Arnett seemed to back Bateman up, joking, "I can say that I keyed Bateman's car. I never admitted that. Because I was like, look at this guy, taking up a spot and a half." Cross, meanwhile, said Tambor--who was fired from 'Transparent'--insisted he's learned from the experience and "he's listening and learning and growing." After her male co-stars finished answering for her, Walters asked, "What was your point about that, though?" Deb said, "If someone approached you and said, 'OK, here's an actor that admits he routinely yells at directors, at assistant directors, at co-workers, assistants,' would you hire that person?" Tambor answered first, saying he would hire that person if he or she had "reckoned" with it, as he has and is "continuing" to do. "I profusely have apologized. Ms. Walter is indeed a walking acting lesson. And on 'Transparent,' you know, I had a temper and I yelled at people and I hurt people's feelings. And that's unconscionable, and I'm working on it and I'm going to put that behind me, and I love acting." As Bateman and Shawkat debated his point, Walter, through tears, spoke up. "Let me just say one thing that I just realized in this conversation. I have to let go of being angry at him. He never crossed the line on our show, with any, you know, sexual whatever. Verbally, yes, he harassed me, but he did apologize. I have to let it go." Turning to Tambor, Walter told him, "I have to give you a chance to, you know, for us to be friends again." "But it's hard because honestly--Jason says this happens all the time. In like almost 60 years of working, I've never had anybody yell at me like that on a set," said Walter, who plays matriarch Lucille Bluth. "And it's hard to deal with, but I'm over it now. I just let it go right here, for The New York Times." Cracking another joke, Bateman said, "She didn't give it up for anybody else." At that point, Hale jumped in and seemingly excused Tambor's actions, saying, "I will say, to Jason's point, we can be honest about the fact that--and not to build a thing--we've all had moments." Walter fired back, reminding Hale, "But not like that, not like that. That was bad." Bateman argued that "context" is important, while Cross said, "I think it's important to note -- and it hasn't been noted--that this kind of behavior that's being described, it didn't just come out of the blue. It wasn't zero to 60. There is a cumulative effect sometimes." Walter would have liked to keep the "blow-up" a private matter, saying, "I never would have brought it up." Walter said she would have no reservation about working with Tambor again, despite the allegations against him and their somewhat fraught history. "I've just given it up. And you know, there's something really, really freeing about that now. I realize that. I don't want to walk around with anger. I respect him as an actor. We've known each other for years and years and years," she explained. "No, no, no, no. Of course, I would work with him again in a heartbeat." Thomas Sadoski, who has worked with Walter, also leaped to her defense on Instagram. Calling her "a national goddamned treasure," he wrote, "I don't give a f--k who you think you are or how good you think you are or how awesome you think your buddy/daddy is: screaming at someone isn't 'part of the business." After some introspection, Bateman decided to apologize on Twitter Thursday. A few hours after Bateman issued his public apology, Hale followed suit on Twitter. "I have reached out to Jessica personally to apologize. Arrested Development is one of my families," said the actor, who plays Buster Bluth. "Regardless of my intentions, it is clear that my words, both said and unsaid, served to minimize Jessica's pain and for that I am extremely sorry." Arnett, Cross and Shawkat have yet to comment on the backlash via social media.